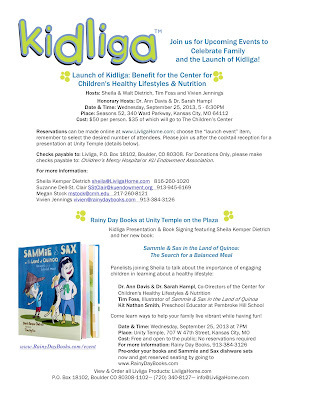 Livliga® Live Vibrant Blog: My First Book Signing for our Health-Oriented Children's Adventure Book Next Week in Kansas City! My First Book Signing for our Health-Oriented Children's Adventure Book Next Week in Kansas City! I wanted to follow up with everyone about the special event coming up next week. It is amazing to think I have actually written a book and have had the great fortune to work with a very talented illustrator, Tim Foss. 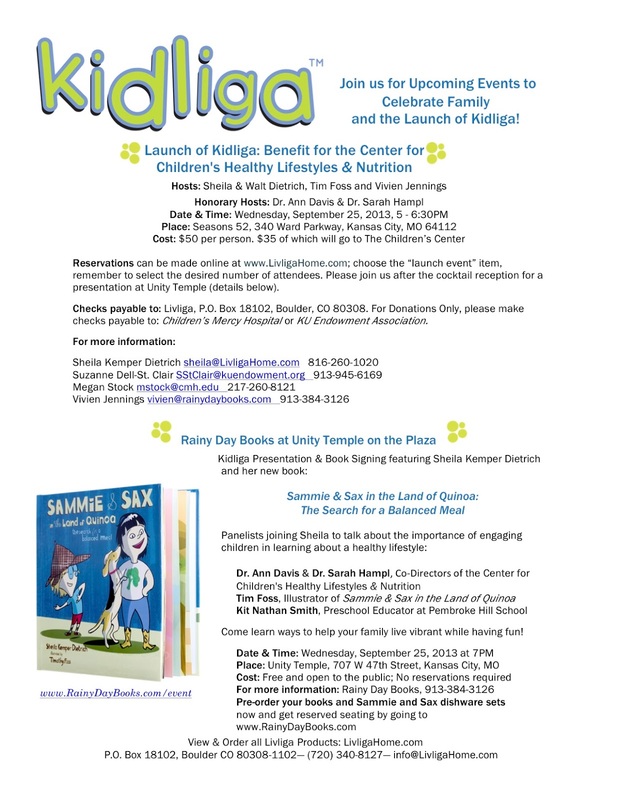 We are coming to Kansas City to share our book and the Kidliga dishware line of my company Livliga. We want to share how the book came about, in addition to what the book is all about! It is an imaginative children’s adventure book that is also a lesson in what a balanced meal is all about. It is the first in a series for young children and their families. Come join us and find out more! At 5pm we are having a cocktail reception at Seasons 52 on the Plaza that is a fundraiser for a very special organization—The Children’s Center for Healthy Lifestyles and Nutrition. The Co-Directors, Dr. Sarah Hampl, of Children’s Mercy Hospital, and Dr. Ann Davis, of KU Medical Center, will be there so you can talk to them in person about there important, groundbreaking research on childhood obesity. At 7pm will be the Presentation and Book Signing sponsored by Rainy Day Books and Vivien Jennings. Part of the presentation will be a chat between Tim Foss and me about the development of the book and then among Dr. Davis, Dr. Hampl, Kit Smith (Preschool teacher extraordinaire from Pembroke Hill School), Tim Foss and me about the importance of projects like ours in helping children grow up understanding their health and living a healthier lifestyle. We really hope you will come be a part of this special event. Feel free to invite others as well! We want this to be the best celebration and book signing ever! By clicking on the live link I have provided you can go right to the event page on our website (LivligaHome.com) to order tickets and pre-order Kidliga dishware sets with my book. I would be honored if you did! When you order now you will not only enjoy the cocktail reception but additionally you will be guaranteed reserved seating for the Presentation and Book signing. Really hope to see you on September 25th. Thanks so much for your support!